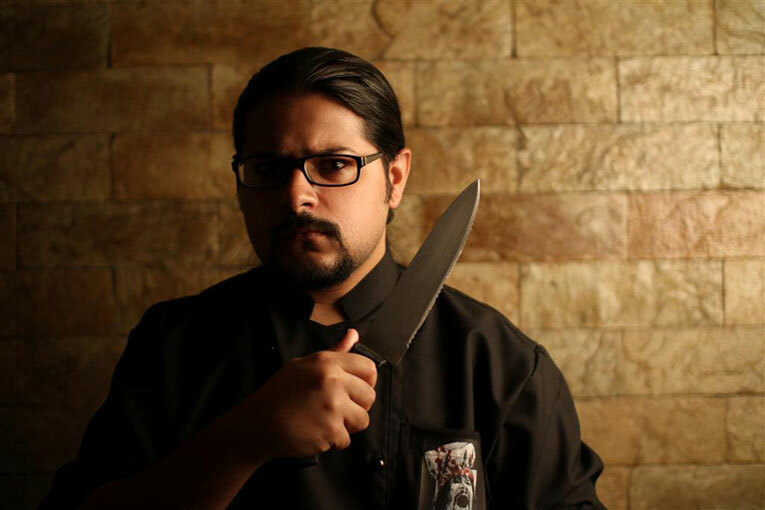 While cooking and heavy metal might be an unlikely pairing in most people’s minds, Sahil Makhija, frontman of Mumbai-based death metal band Demonic Resurrection, relishes the combination. In early 2011, Makhija—better known in the local metal scene as the Demonstealer—merged his passion for cooking with his love of heavy music by creating Headbanger’s Kitchen, a one-of-a-kind cooking show for heavy metal fans on YouTube. Choice cuts on Headbanger’s Kitchen. In each episode of Headbanger’s Kitchen, Makhija cooks signature meals (including the now-famous Black Label Chicken Curry, the Heaviest Chhole Bhature in the Universe, the Bhayanak Bacon Bomb, and the Undying Meatzza) for one heavy metal band that he admires, followed by an interview with the band. The 16 episodes of Headbanger’s Kitchen uploaded so far have featured musicians from acclaimed bands such as Lamb of God, Gojira, Karnivool, Nervecell, and Bhayanak Maut. After two years of funding Headbanger’s Kitchen episodes on his own, the Demonstealer is now looking to his fans to fund the next season of the show, because, as he puts it, “It’s simple. It costs money to make a show.” Using Wishberry, an online crowd-funding platform, Makhija has set up a page for fans to contribute to the initiative. Though the format of the show will largely remain the same, he hopes to use the money generated to improve production values and streamline the production process. In less than a week, more than 75 fans have already contributed more than Rs. 135,000 (out of the target amount of Rs. 240,000) towards the next season of Headbanger’s Kitchen. Donors receive exclusive rewards for their contributions, ranging from episode previews and free merchandise to free meals and cooking classes from the Demonstealer. At the end of the day, as a host and musician, Makhija feels that it is important for him to stay connected with his audience. This crowd-funding campaign is one way of extending that connection. Click here to make a contribution to Headbanger’s Kitchen. Sahil Makhija spoke to us about five of his favourite things to cook for friends and family. Click here to find out what they are.